After an evening watching the sun set over the Pacific Ocean, Tori, Grayson, and I headed in the other direction, into the snowy Cascades. Wow. Pine trees covered in inches of snow, falling onto the road, buried deep beneath several more feet of white powder. Day two of our grand Pacific Northwest engagement was everything I could have dreamed of and more. 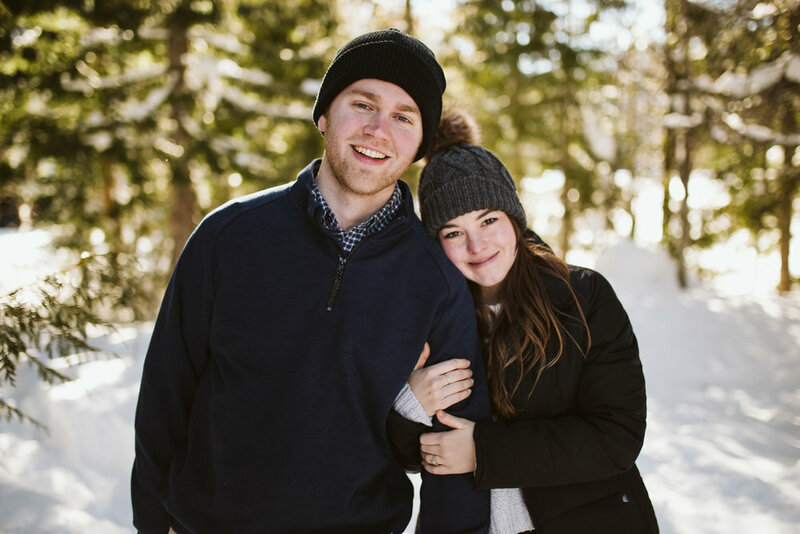 Take a look through these snaps of snowy lovebirds, and read a little bit more from our adventure below! Being from Tennessee, I don't see real snow very often. We had about 8 inches once, which melted within 24 hours, and the big, fun snow week that Nashville had a few years ago came while I was in Chile. 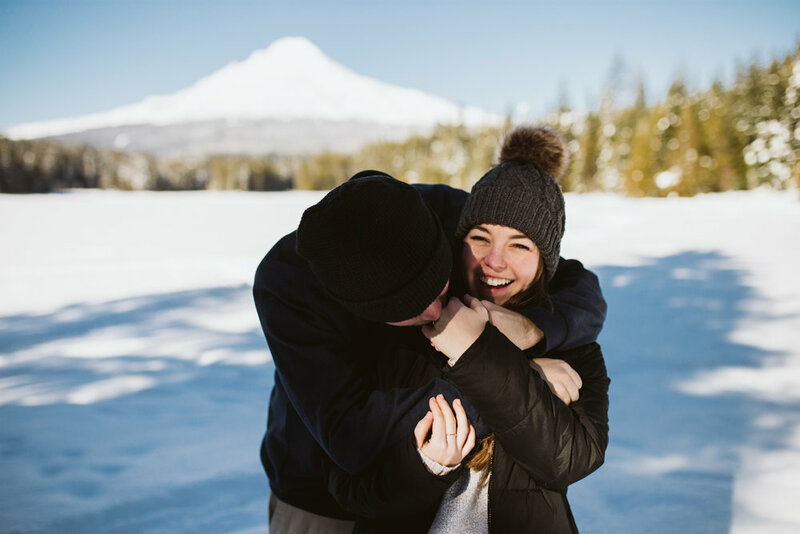 So needless to say, I was both excited and unprepared for our little hike to Trillium Lake for part two of Tori and Grayson's grand Oregon engagement session. We borrowed a roommate's jeep to head into the mountains, picked up our snow park pass on the way (after first being forbidden to enter a members-only grocery store? Still offended, but no worries, we found a sporting goods store with just the pass we needed), and drove deeper and deeper into the snowy highway. The road that Google maps had in mind was covered in several feet of snow, so we stopped a bit early in a little parking lot and walked the snow shoe and ski trails with our hiking boots. We walked a few miles in between massive, glistening pines until the trees opened up into a snow-covered lake, resting below Mt. Hood. This Tennessee girl has definitely never walked on a lake. 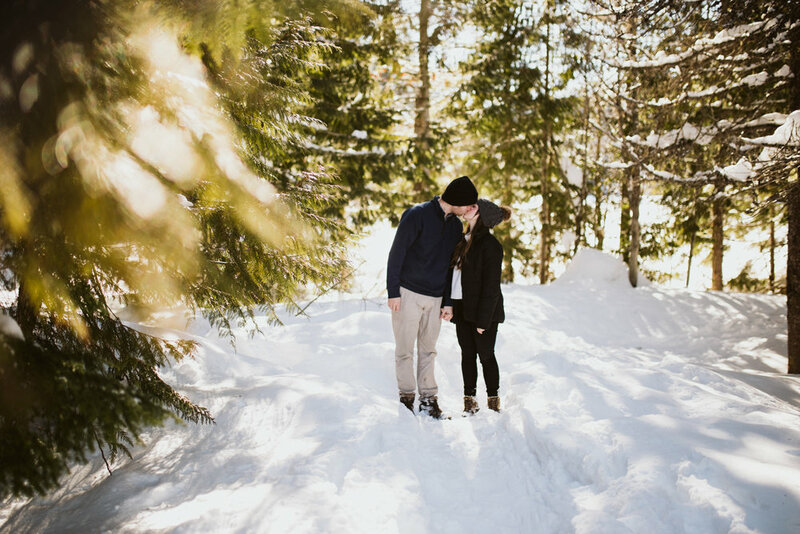 Since I'm determined not to let this be my last snowy Pacific Northwest session, I've gathered a few tips for the future, for myself and for couples. Firstly, embrace that snow. Easy to say when it was sunny out, but we dove right in and stepped off trail (both intentionally and unintentionally) into several feet of snow, dusted ourselves off and moved onto the next snow bank! Secondly, probably consider snow shoes… While I've never worn them, the hikers who had them on seemed to be doing quite well… And I'd imagine that might widen my possibilities for angles and keep my feet a little less wet. Thirdly, hand warmers really are made of magic. You can't go wrong with those photos of blowing snow and throwing it in the air, but when it's 24 degrees out, fingers get cold. Shout out to Tori for braving the cold hands for these, even when Grayson called it quits! Finally (though I'm sure there's more if you want to chat about my very partially-informed opinions on the matter!! ), have so much fun! Dance, kiss under the pines, push your fiance into the snow, make friends with hikers' dogs, stare for a few minutes at the big mountain in front of you, watch the skiers fly across the lake.